Friedrich Georg Weitsch painted Humboldt two years after his return to Europe. Imagine if Albert Einstein had been the first person to summit Mount Everest. That is how Gerard Helferich, author of Humboldt’s Cosmos, describes, for a modern audience, Alexander von Humboldt’s achievements and impact on the public in the early 1800s. Helferich is spot on. Humboldt had the acute mind and energy a scientific traveler needed back in the Age of Sail. And he actually did set a world climbing record, too. During his five-year journey in the New World (1799-1804), he and his companion Aime Bonpland climbed Mount Chimborazo in Ecuador, considered the highest mountain in the world at that time. They also collected thousands of plants, animals, and geologic specimens and brought them back to Europe. Along the way, their work was both physical – proving, for example, that the Amazon and Orinoco river basins were connected by exploring the Orinoco in a canoe – and mental, such as Humboldt’s invention of isoclines for use on maps or his ground-breaking recognition that the same sorts of plants grew in both the Old World and the New. The two Europeans survived the trip, despite a few close calls, and returned home to a hero’s welcome. Then Humboldt wrote it all up. Yes – all of science. 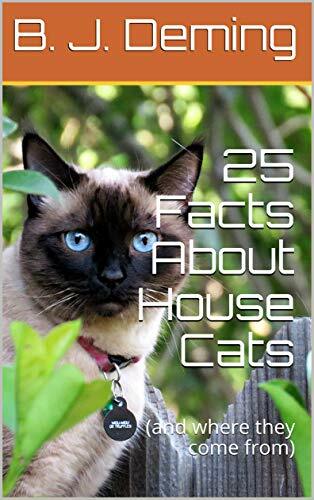 And it was very, very popular. Here’s how Kosmos came about. 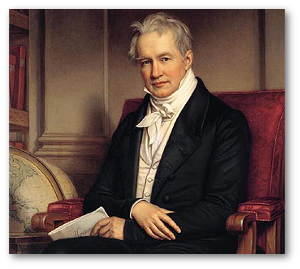 By the late 1820s, Alexander von Humboldt was working in Berlin as an advisor to King Freidrich Wilhelm III. At the time, German intellectuals were getting heavily into romanticism. Emotion, they argued, is more authentic than reason. Intuition, not thinking, gives a better insight into Nature. Humboldt thought this was nonsense and decided to do something about it. Josef Stieler painted Humboldt in 1843, two years before the first volume of “Kosmos” was published. In 1827 he started what would turn into a series of 61 lectures, based on his travels and discoveries, at the University of Berlin. Due to popular demand, he did another series of 16 simplified lectures that all Berlin society attended. 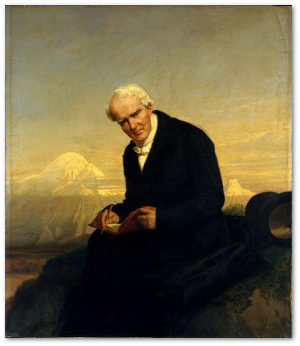 In his talks Humboldt started objectively with astronomy and the Universe and then described Earth in terms of physical sciences – geology, botany, meteorology, and so on. This objective activity put mankind right at the hub of things. People, Humboldt suggested, were necessary to give Nature subjective meaning. The next part of his series therefore focused on the history of science – all the ways that we have appreciated Nature’s beautiful complexity and tried to understand it. Only after laying these objective and subjective natural bases did Humboldt finish up with a summary of astronomy, the Earth’s physical properties, and geological formations. Julius Schrader painted him in 1859. Humboldt believed he contracted that rheumatism during his New World journey. Chimborazo stands in the background. Humboldt’s lecture series was such a public sensation that the king ordered a commemoration medal struck for the event. Humboldt’s publisher offered him a large advance to publish the notes in book form, but Humboldt asked him to wait until he could rework it to include the most up-to-date information. It turned out to be almost a 20-year wait. The author wrote from about 9 p.m. to 3 a.m. after finishing his official duties at court. He then sent what he had written to his international network of fellow scientists for review and updates. Finally, it all had to be collected and edited together. Okay, that was Humboldt’s publisher, but Kosmos was indeed a runaway bestseller. By 1851, the three volumes thus far published had been translated into just about every European language. 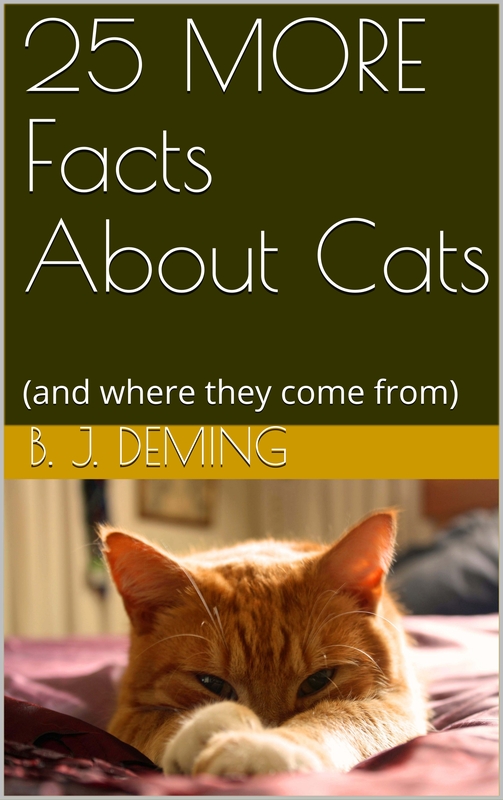 There were five authorized German editions and no less than three English translations. Commentaries on Kosmos were a spin-off industry. The king ordered another commemorative medal struck. Volume III hit the stands in 1850. In 1857, Humboldt had a slight stroke (he was 88 years old, after all). However, Volume IV of Kosmos came out in 1858. In the spring of 1859, he sent Volume V to the publisher. Two days later he was bedridden, and he died 15 days after that. That last volume was completed from Humboldt’s notes and published posthumously in 1862. 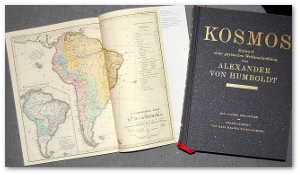 In 2004 (PDF), Kosmos was published for the first time in one volume following Humboldt’s original text. 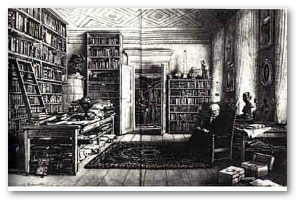 There is a picture of Humboldt’s work room, dated 1856, the year before his stroke. You can hardly see the old man for all the books and papers. Many of Humboldt’s discoveries were so fundamental they came to be taken for granted, and their source was eventually forgotten. His strength lay rather in opening avenues of research that could then be developed by others…Humboldt assumed, in the words of a biographer, “the anonymity of a great teacher,” remembered with gratitude by his students but remaining in the background. 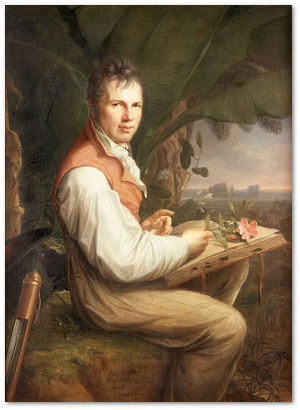 Today, Alexander von Humboldt is much more revered in Latin America and Europe than here in the US, where he’s just the guy a lot of places are named after. That’s a shame, but it also makes one’s discovery of this amazing man and his accomplishments all the more special. It is a little like seeing a darkened room for the first time after turning on a light. The desire to explore it further makes one unwilling to turn the light off and leave. Should you want to explore further, there are some excellent resources below the tip jar.